Low furniture, like this platform bed and the shelf next to it, remind me of the habit of oriental people to lounge close to the ground. 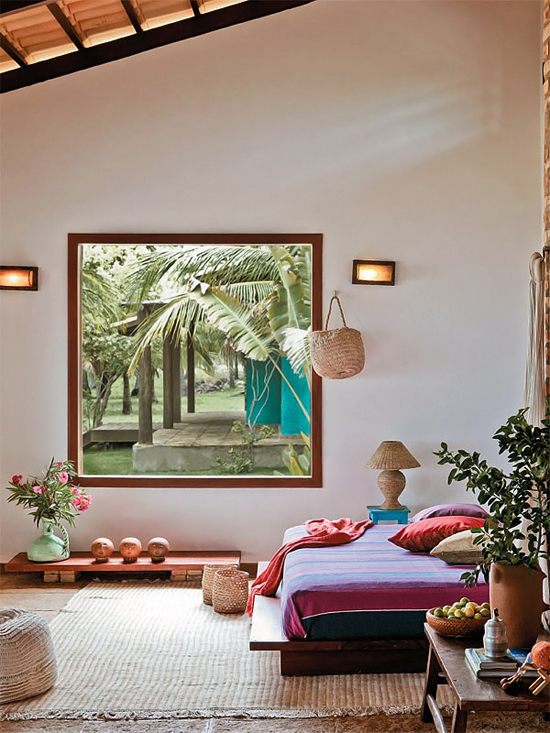 You can toss a few pillows on the floor as well to create a cozy nook and multiply the 'living low' effect. Color is commonly used in ethnic decorations. You don't have to paint your walls in bold colors, a patterned folkloric throw, some cozy pillows on the bed as well as bright accents, like a vase or a turquoise side table would be enough. A large view framing a blissful tropical scene would be ideal but probably a distant luxury to find in the city. You can always fake it, however, with a mural or a big framed photo of your favorite holiday spot. The bigger the picture the more will give out the desired feeling. Texture is vital for an ethnic inspired environment. Rattan, seagrass, unrefined wood and wool will do the trick. As you see in this room, there is a plethora of such textures on the rug, the table lamp and baskets. No need to say that there has to be at least one unrefined rustic piece of furniture in the room to induce an aged feeling. I like this side table but you can choose a stool, a chair or anything else that you might come across and love. Image via casa.com.br (found via nicety). 3 comments on "Just make it work: Ethnic bedroom"
Me encantaría pasar unos días en un espacio como ese. Transmite tranquilidad y sosiego. We have an ethnic bedroom and we love it!